Virginia asserted its dominance against Virginia Tech this week, but the Hoos have an even tougher test on the horizon this weekend. WASHINGTON — So much for a duel in the Dominion. Tuesday’s ACC battle royale between No. 4 Virginia and No. 9 Virginia Tech turned into a rout almost from the outset. The Cavaliers scored the game’s first five points and held the Hokies without a field goal for the first three and a half minutes. There would be no repeat of last winter when coach Buzz Williams’ scrappy bunch shocked then-second ranked U.Va. in overtime. Instead, the Cavaliers hit 59 percent of their shots and 54 percent from three-point range while winning the battle of the boards 27-19. The 22-point point lead at intermission would turn the entire second half into mop-up time as coach Tony Bennett’s team emerged as the ACC’s last remaining team unbeaten in conference play. And just like Florida State two weeks ago, another Top 10 team tumbles before leaving John Paul Jones Arena. The current gap just isn’t between Charlottesville and Blacksburg: Virginia’s four league wins have come by an average of 20.5 points per game. While a date with No. 1 Duke awaits, the Cavaliers have undercut their local foes (don’t you dare tell the Charlottesville faithful that the Hokies are their rivals) once again. Set your calendar for Monday, Feb. 9, when these two teams battle in Blacksburg. This is the second of four Friday games for the Terrapins this winter. Friday night hoops should involve me wearing a blue foam finger in Manchester, New Hampshire, and scrounging up enough money to get breadsticks at Luisa’s Pizza on the west side. The Terps have won consecutive games against Indiana and Wisconsin despite not putting together complete 40-minute efforts. What’s encouraging is that even when things have gone sideways this month, head coach Mark Turgeon’s young team has found a way to win. The Buckeyes have dropped three straight, including a three-point loss at Rutgers. Perhaps they need to get the ball more to Kyle Young, who leads the conference in shooting (72.1 percent) but has taken just 12 shots during the slide. Both teams are looking to bounce from discouraging defeats — the Spiders lost at home to Duquesne for the first time in 25 years, while the Wildcats fell at St. Joe’s by one. Both teams bring plenty of firepower to Belk Arena: Davidson leads the A-10 in three-pointers made per game, while the Spiders rank second in the conference in field goal percentage. American (8-8, 2-3 Patriot League) vs Lafayette (4-12, 1-4), 2 p.m.
How friendly has home court been for the Eagles thus far in conference play? They’re 2-0 at Bender Arena and 0-3 outside D.C.
Perhaps this is the game where Sa’eed Nelson finds his stroke from three-point range — the Leopards rank last in the Patriot League at defending the three and are ninth in scoring defense. But, they do have a pair of offensive threats in Justin Jaworski (18 points per game in league play) and Alex Petrie (50 percent from outside the arc in conference action). It’s not the football game, but this mid-January matchup has two schools recovering from nightmarish pre-conference schedules. While the Midshipmen are still trying to find their way after losing last year’s leading scorer Shawn Anderson to graduation, the Black Knights are led by juniors Matt Wilson inside (second in the conference in rebounding) and Tommy Funk outside (second in assists). Can the Hokies pick themselves back up from Tuesday night’s wreckage? They face a Demon Deacons team that is fresh off upsetting No. 17 NC State, holding the Wolfpack to 37 percent shooting and 21 percent from three-point range. Wake also has a second-generation star in Brandon Childress (son of assistant coach and 1995 ACC Tournament MVP), who’s averaging 16 points with four assists per game. Despite the debacle in Charlottesville, Tech does lead the ACC in shooting and ranks second in scoring defense. They should be able to find get their mojo back at Cassell Coliseum. Howard (7-11, 1-3 MEAC) at South Carolina State (4-15, 2-1), 4 p.m. Remind me not to buy into the Bison until they have a winning record entering February. Eight losses in nine games have one feeling that “next year” won’t be happening this year. Tuesday’s defeat to Morgan State was made possible by 18 turnovers and R.J. Cole’s second-lowest scoring output of the season (12 points in 42 minutes). But as long as Cole and Charles Williams (25 points against the Bears) are around, the Bison are a threat to break out on a scoring spree. And bring me back into the camp thinking that it might just happen this winter. The Cavaliers will have little time to bask in their beatdown of the Hokies, traveling to Durham to face an angry Blue Devils team that lost at home as a top-ranked team for the first time ever (previously 60-0 in that situation). Adding injury to insult, guard Tre Jones is out indefinitely with a right shoulder sprain. But they still have the ACC’s leading scorer in R.J. Barrett and walking double-double Zion Williamson to test the pack-line defense. 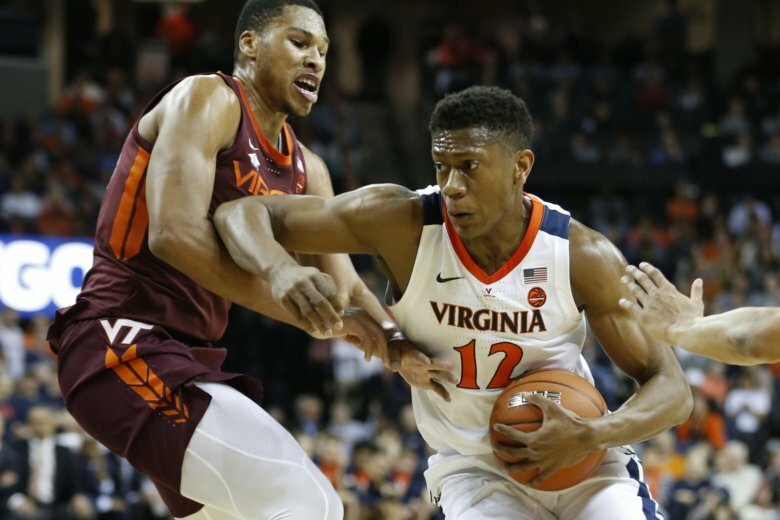 U.Va.’s ultraefficient offense that leads the league in assist-to-turnover ratio won’t easily have its way with a Duke defense that holds teams under 40 percent shooting and under 30 percent from three-point range. The Rams defeated Dayton Wednesday thanks to Marcus Evans. The Rice transfer scored 17 points, including the team’s last seven and the go-ahead three with 33 seconds remaining. The Minutemen may be tied for last in the conference, but three of their four league losses have come by five points or fewer. They lead the A-10 in three-point shooting and are No. 2 in field goal percentage, while junior guard Luwane Pipkins scored 38 points last year against the Rams. The Patriots outscored UMass 18-9 over the final 6:40 of the second half to beat the Minutemen 68-63 Wednesday as Justin Kier tallied 22 points and 9 rebounds. The junior is averaging 20 points and 12 rebounds in league play. That makes up for Otis Livingston II struggling over the last three games to the tune of 7-32 shooting (22 percent). The Rams lead the conference in turnover margin, but are 1-4 on the road (including a defeat to Houston Baptist). The Colonials bounced back from a horrid first half at La Salle by shooting 68 percent after intermission in their 59-56 win Wednesday. They’ll find the Dukes a little tougher to contend with, even though the game is in Foggy Bottom. Duquesne is 12-5 and 3-1 in the league for the second straight January, though last year’s edition stumbled the rest of the way into a 16-16 finish. Sincere Carry averages 5.5 assists per game; I can’t think of a more appropriately-named point guard.